Instant Pot Aloo Gobi is perfectly seasoned with Indian spices and makes a wonderful vegetarian main dish or side dish for an Indian-themed meal. This Instant Pot Cauliflower with Potatoes recipe is so quick and easy, you can have it on the dinner table within minutes. Aloo Gobi is one of those dishes that you’ll find on any Indian restaurant menu and is a simple dish made in Indian homes every day. 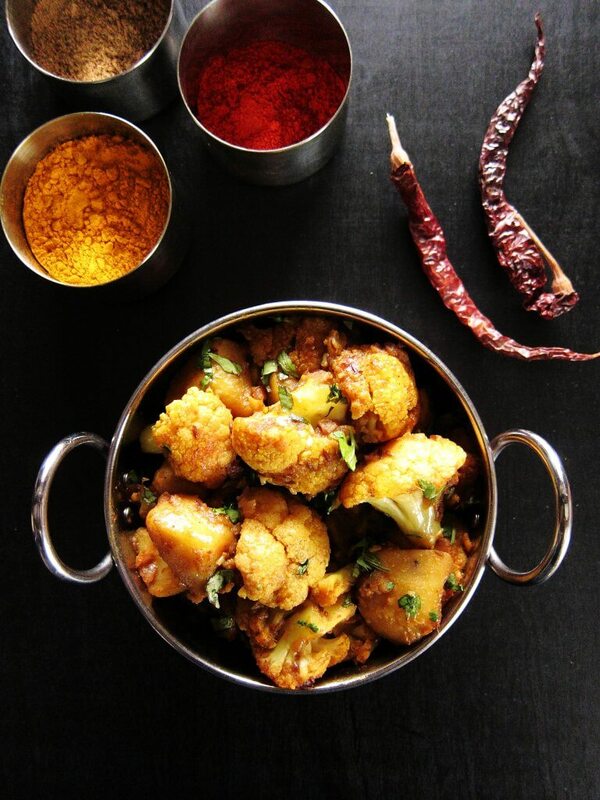 Aloo Gobi (pronounced aa-loo go-bee) is translated from Hindi as ‘Potatoes Cauliflower’. I love cauliflower and since I’m always looking for new recipes I can make in a pressure cooker or Instant Pot, I had to figure out how to make Instant Pot Aloo Gobi (Instant Pot Cauliflower and Potatoes). The main challenge with making pressure cooker or Instant Pot cauliflower is that it can easily be overcooked. Cauliflower releases liquid and cooks very quickly in the Instant Pot. So it has a tendency to get soggy. 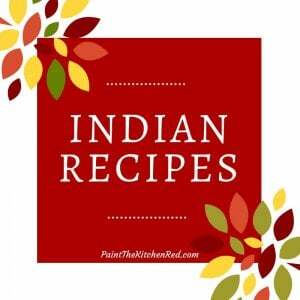 Some Indian Cauliflower and Potatoes recipes have a curry or gravy and some are more dry. I like to make the drier version. My goal was to create a drier dish without overcooking the cauliflower. I had to add enough water to allow the Instant Pot to pressurize, without making the dish too watery. And I had to cook the Instant Pot cauliflower just right, so that it was neither mushy nor under-cooked. It took a few tries, but I think I found just the right combination. I am super pleased with how it turned out. Don’t cut the cauliflower too small. Cut them into florets that are about 1 1/4 inches long and 1 inch wide. And when you wash the cauliflower florets, let them dry out a bit. I use a salad spinner to dry them out. The less water, the better, for this recipe. Cut the potatoes into about 1 1/4 inch cubes. Yes, you do cook the cauliflower for 0 minutes. After cooking the cauliflower, if you find that it’s not cooked enough, just close the Instant Pot again and let the cauliflower steam in the residual heat, or cook the aloo gobi in ‘Saute’ mode for a couple of minutes at the end. When you finish cooking the Instant Pot cauliflower, you might have some brown bits stuck to the bottom of the inner pot. Carefully stir the cauliflower to incorporate these bits – provided they’re not burnt – they give a caramelization effect, which is really tasty. If you wish to make the dish less dry, add more water when you add the cauliflower. If you’re a fan of spicy food, feel free to increase the quantity of cayenne pepper or Kashmiri chili powder to 1 teaspoon. If you’re new to the Instant Pot and aren’t familiar with how to use it, please read the Instant Pot DUO Beginner’s Quick Start Guide or the Instant Pot ULTRA Beginner’s Quick Start Guide first and then come back here to learn how to make Instant Pot Aloo Gobi. Add ghee and heat till melted. Add cumin seeds and saute for 10 seconds, till fragrant. Stir in onion, ginger, jalapeno (if using). Cook until onion is golden brown, about 3 to 4 minutes. Turn Instant Pot off by pressing ‘Cancel’. Stir in turmeric, chili powder, coriander, garam masala and salt, and fry on residual heat till fragrant, about 1 minute. Be careful not to burn. Deglaze with 1/2 cup water and stir to scrape up all the brown bits. The display will count down from 4 to 0; it will switch to ‘Keep Warm’ mode and display ‘L0:00’. Do a quick release: move the steam release handle to ‘Venting’. I like to place a folded towel over the steam release handle and move it to the venting position. Remove towel after turning handle. When the time has elapsed, the display will switch to ‘Keep Warm’ mode and display ‘L0:00’. Do a quick release again: Move the steam release handle to ‘Venting’. Remove towel after turning the knob if you’re using a towel. Stir to incorporate any brown bits into the dish. Garnish with chopped cilantro. 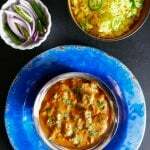 Instant Pot Aloo Gobi is perfectly seasoned with Indian spices and makes a wonderful vegetarian main dish or side dish for an Indian-themed meal. This Indian Cauliflower with Potatoes recipe is so quick and easy, you can have it on the dinner table within minutes. Press ‘Saute’, add ghee and heat till melted. Deglaze with water and stir to scrape up all the brown bits. Add potatoes and close Instant Pot. Cook on 'Manual' (or 'Pressure Cook') mode for 4 minutes. Close Instant Pot again and cook on 'Manual' (or 'Pressure Cook') mode for 0 (zero) minutes. Do a quick release again. Carefully stir to incorporate any brown bits into the dish. Prep time does not include steps that are already accounted for in the ingredient list, e.g. chopped onions, minced garlic, cubed potatoes, etc. Optional: squeeze lime juice over aloo gobi at the end of cooking to give it a slightly tart flavor. 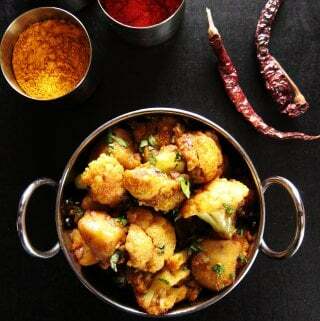 If your cauliflower is large, you can increase the spice quantities as needed. What a delightful dish. My entire family enjoyed this one. Thanks. You’re welcome, Peter. I’m glad they liked it. I’ve never heard of this dish but all of the ingredients sound amazing together! I’ll have to try it! I hope you get to try it, Mindy! Your step-by-step directions are amazing! I think you’re right, the cauliflower could easily be overcooked but by following your directions that wouldn’t be an issue – looks amazing!! I love your step by step photos and instructions. I’ve not made this for ages, I am so glad I saw this for a timely reminder. It’s such a comfort dish. I am loving your instant pot step-by-steps even though I don’t have one. I’ve never used a pressure cooker before so this is like reading another language. Love your step by step instructions, and the way you figured out how to keep the right texture for the cauliflower. This was a great recipe flavor wise, but I made a few changes the second time. I like my aloo gobi saucier than your original. I also thought the potatoes got a bit mushy. So I did (the second time) everything you suggested with the onions and spices (except I doubled the spice content to allow for sauce). Then I added my cauliflower, and layered my potatoes on top (cut just slightly larger than suggested.) Added about a cup of chicken stock and did manual for 4 minutes and let it sit after cooking at high pressure for about a minute and then let the pressure out. Still great flavor, a bit saucier than the original and I enjoyed the texture. Also, added peas because I married an english man……and well peas… Thanks! Susan, I’m really glad you were able take the recipe and make it your own. In my opinion, that’s the best part of cooking! 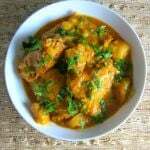 , thanks for sharing your modifications to the recipe. Good flavor but it was like mashed potatoes and slightly undercooked cauliflour for me. Disappointed but I appreciate the effort put in. Not sure what I did wrong. Oh, I’m sorry it didn’t work for you, Eric. Since you liked the flavor, maybe try it out again but this time adjust your cooking times. So cook the potatoes for a couple of minutes less and increase cauliflower time by a minute. I’m not sure what went wrong: type of potatoes, size of the veggies, altitude, or who knows? 🙂 Thanks for taking the time to comment, though. Delicious! As a fairly new Instant Pot cook, I really found your instructions helpful, and did not know there was a “0” setting. The dish was delicious despite the fact that I only had powdered ginger, and did a few spice substitutions as I didn’t have all the spices. Perfectly cooked. I will be printing this and making it again. Hi Marni, I’m glad you like the recipe! Search for my recipe for roasted cauliflower and potatoes (not an Instant Pot recipe) in the search bar. If you like roasted veggies, you’ll like that one too. Thanks so much for taking the time to comment – means a lot! This was fabulous; thanks for posting it and sharing such detailed directions! I used Yukon Gold potatoes so they’d hold their shape and was careful not to cut the pieces too small. The times you suggested were perfect. I used an entire head of cauliflower and more potatoes, so increased the spices by 50%. My bulk spices retailer didn’t have an Indian chili powder, so I used what MarketSpice calls Aleppo Chili Powder, figuring that since it was from that side of the world, maybe it would be close to what you suggested. It was great. I packed up half of the completed dish for a friend and after an hour on ‘Keep Warm’ mode, we ate the rest. It was softer by then, but the vegetable chunks were still recognizable and the flavor delicious. This will be a regular dinner choice in our house. I might throw in some green peas sometimes, just to be different. Again, thank you! Hi Dianne – I’m glad that the timings worked for you. It is hard to get the recipe directions just right when you have vegetables that can overcook with small size changes and even 30 seconds of pressure cooking time! If you ever go to an Indian grocery store, ask for Kashmiri chili powder – it has color but is not super spicy. It’s what I use. But I think your Aleppo chili powder was probably just right too. Thanks for sharing your experience – I really appreciate it! 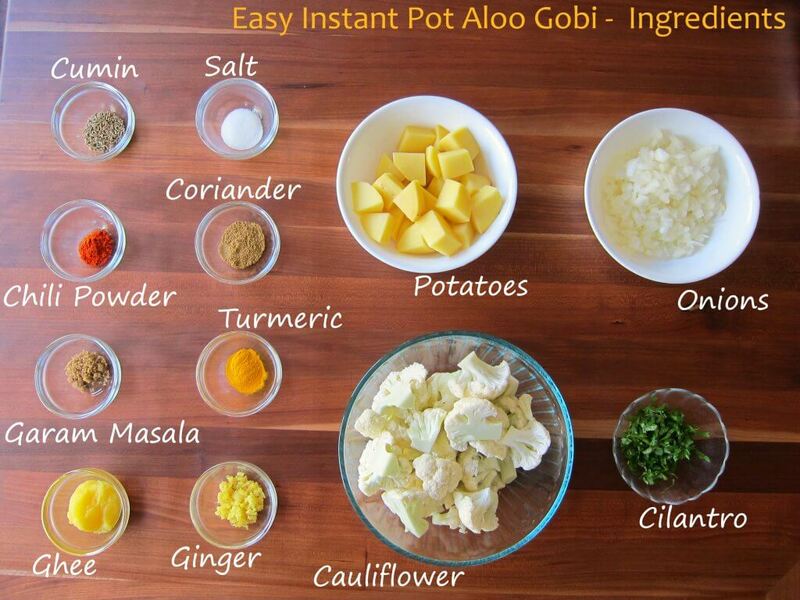 Aloo Gobi is one of my favorite dishes but I’ve never made it myself. 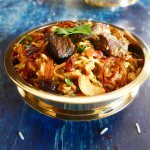 I tried this recipe in my Instant Pot and it was so delicious. I cooked mine just a minute longer and added about 1/3 cup more water. I had to force myself not to eat the whole pot! Thank you for this recipe. Hi Cheryl – Thank you so much for taking the time to comment and let me know. I too love cauliflower. Try it with peas too next time. It’s a common addition for this dish. I made this today for the first time in the IP. It came out delicious and saves time, but the potatoes were a little over done/mushy. Will adjust the time next time. I also added hing/asofatida with the jeera. It has a great flavor. 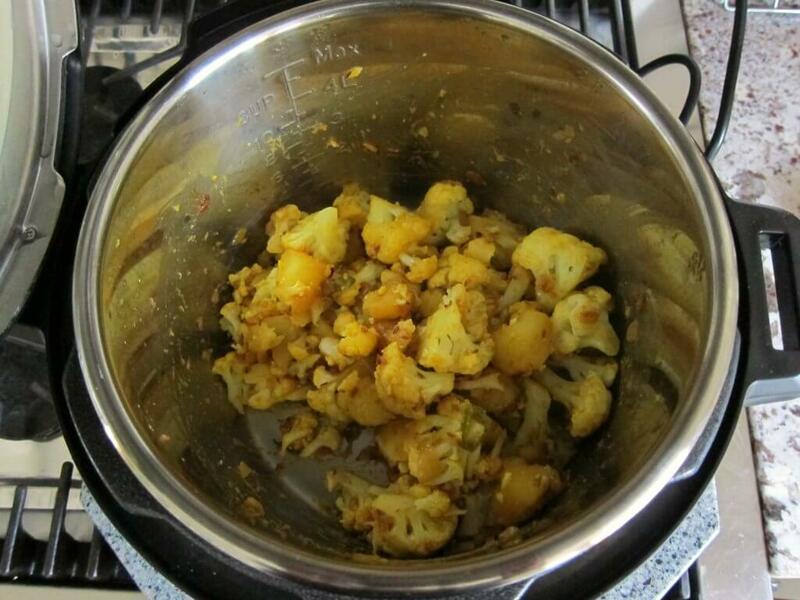 Once the cauliflower was done I added a tsp of amchoor/dry mango powder instead of lemon juice. Needs to be gently stirred in. Also tastes really good. Thanks for the detailed instructions. Hi Vibha – it’s a fine balancing act to cut the cauliflower and potatoes in such a way that both cook just right. Great additions: hing and amchoor! Thanks for your comment. Made this today as a test for a dinner party I am having Saturday. Absolutely delicious flavors. I doubled the spices as a few of the other commenters suggested and added a bit more water. I used Yukon potatoes and didn’t peel them. I will next time. I will also cook the potatoes for 2 minutes and then the cauliflower for 2 minutes next time. But the detailed instructions you provided and the photos were absolutely fabulous. I am new to Instant Pot world and this was such a wonderful recipe to try out. I will be following your blog now! Thanks Carly! I’m glad you enjoyed the recipe. And thanks for letting us know the changes you made. Hi Barbara – that’s so kind of you – that would be great if you don’t include the full recipe and provide a link back – thank you!! I tried this recipe today. I followed your instructions, except for one change – I added one diced tomato after sautéing the onion-ginger-green chili mixture. My Instant Pot came to pressure to cook the potatoes, but it did not come up to pressure the second time around after stirring in the cauliflower. I think it could be because the pot became too dry and also maybe the bottom of the pot may not have been fully deglazed well? In the end the cauliflower was little undercooked, so I added a bit more water to the pot and cooked it on Sauté mode for a couple more mins. Hi Dhanya, tomato is a great addition, but it could have caused some sticking to the bottom. Yes, deglazing is very important especially since the recipe uses minimal liquid. Next time, just add a few more tablespoons of water. This was delicious and so easy. We added a bit more water (1 cup total) and incorporated cooked rice and peas at the same time we added the cauliflower. Cooked cauliflower etc. on high pressure for 5 additional minutes and it did not get mushy. Flavors blended well. We served with yogurt, mango chutney, and some curried pickled veg. Will definitely make again. Great – you made it a meal in one. Wow, that’s good to know that the cauliflower didn’t become mush with 5 minutes! Thank you for taking the time to share your experience, Kristin. Hi Paula, thank you for taking the time to comment. That’s so great to hear. I just made a roasted version of this recipe last night, for a change: same spices as this recipe but followed the method of this recipe: Indian Roasted Cauliflower! Thank you Neena! I was gifted an Insta Pot for Christmas, from my brother. Your step-by-step instructions were perfect. I love to cook, I have a lot of gadgets and not easily intimidated by new cooking tequneaks. But, I was terribly intimidated by Instant Pot. You calmed my nerves by spelling it all out! I’m so grateful! Bonus, the aloo gabi was delicious. You’re so welcome, Shannan 🙂 I’m really glad that you liked the recipe. Awesome, Lauren – glad to hear it and thanks for letting me know!